11 different Artists from the Netherlands, Austria, Czech, Romania and Ukraine were inspired by the unique nature of the Synevyr National Nature Park and expressed the beauty in paintings, drawings, photos, landart and dances. This Area of Inspiration is part of an EU Creative Europe project involving areas in Estonia, Czech, Slovakia and Ukraine. The week was a huge success; Wilderness was experienced, artwork was created and friendships were formed. This post is a short summary of our week. Read more about the artists Janin Salzger, Jan Botek, Ruslan Gleb, Rick Lichtenberg and Richard Verbeek, Svitlana Kyrlyk, Liset Van Dommelen, Henk Kuipers, Daniel Mîrlea , Miriam Hartman and Vit Hrdousek, who participated in WILDArt Synevyr National Nature Park in the Ukraine. 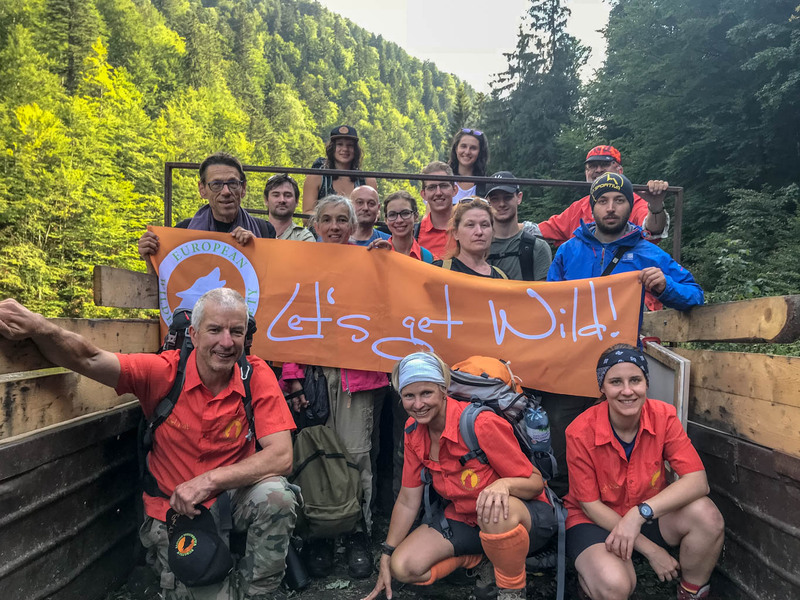 The arrival team led by the European Wilderness Society started to set up the WILDArt camp prepared for WILDArt by Mykhailo Betsa of the Synveyr National Nature Park Economy Department. A cooking tent was set-up, the campfire was prepared and we unloaded all the equipment plus the food we bought at the local market. The first day was all about introductions to the Synevyr National Nature Park team led by Park Director Mykola Derbak. Also Yuriy Tyuh, deputy director of Synevyr National Nature Park, kindly provided daily ad hoc support wherever possible. The artists were then accompanied by Yuriy Babichyn to visit Synevyr Lake, the main touristic attraction of the Synevyr National Nature Park and the name giver. The artists spent time exploring the lake, and Yuriy Babichyn as head of educational department, shared folk legends of the lake. Whilst visiting the lake, the artists were inspired by a 13m high structure of Syn and Vyr, carved into mahogany and started to paint, photograph, sketch and dance around this great lake. One folk tale was of a man that moved to the region from the coast, and he missed the sea so much that he prayed he would be able to see it again. The eye of the sea rose up and up into the mountains to see the man, and it became so high that it fell, and became Synevyr Lake. The trees that fringe the lake are the eyelashes. I am grateful to the European Wilderness Society for inviting us to participate in the creative part of the project. For me it was really a new experience with new feelings, this incredible combination of extreme and calm creative life. Next time, when we will be again in such difficult to access, but amazing places of nature, I would like to stay there longer. This would give me a possibility to observe the beauty of creation, changing in time and capture it on canvas. Thank you very much! The next day the whole group of artists hiked up to Wild Lake, passing through beautiful, unlogged forest with trees that towered up to 40m high. The group were all wearing big backpacks, and worked together to carry up the artistic supplies and the camping supplies for the night including tents, stove, water filter, food and sleeping bags. Special arrangement allowed the group to make an overnight stay at the Wild Lake. Under the guidance of Wilderness Director Vlado Vancura, the artists were informed about the natural beauty of the forest and the lake itself. This lake is special, because it is the only lake in the Ukrainian Carpathians with an island of spaghnum moss. The whole trip challenged me to leave my comfort zone but use the technical skills I already have into new ways or try new subjects. I really liked to go into the forest. It was going into a new special world, when you came through the entrance. I really liked the time with all the other people, seeing them laugh, having fun, and film them. I really like to go on such a trip again. This lake was a huge contrast to Synevyr Lake, because here there were hardly any tourists, compared to Synevyr Lake. It was quiet and peaceful, and the artists reached the lake in the early afternoon which gave them time to really feel the nature and let it inspire their artwork. Despite the less touristic character of the Wild Lake, the artists also noticed the impact that visitors leave behind at this beautiful lake. Inspired by the ‘leave no trace’ ideology, the artists brought back bags filled with garbage to leave behind a clear and natural Wild Lake. Well, I have a lot of wilderness experience throughout Ukraine, but this visit to the lake was very unique and very special, even for me. I have never seen a lake like this, and I know that this is a very unique place. I would like to attend something similar, if this event would be organised in the future. The supportive staff of the Synevyr National Nature Park management helped with our transport arrangements, and provided a reliable Soviet Army truck ZIL 100 to carry us all to high alpine meadows close to the UNESCO World Nature Heritage Beech Forests. Our team and the artists all stood in the back of the truck, clinging to the sides, dodging wayward tree branches and wearing big smiles. I liked the diversity of the group, which also mirrors diversity of nature for me. We had a lot of different artists, a lot of different ideas to get inspired by, just as a beautiful ecosystem should be very diverse and inspiring. The hike then began, and led by the regional chief ranger of this area we began to climb, passing through plains full of blueberry bushes, and slowly getting blue lips and teeth as we moved through, eating berries. And then we entered Wilderness – the UNESCO World Nature Heritage Beech forest. The trail disappeared and we hiked through pristine forest, occasionally seeing evidence of bears and wild boar using the area. The group really hiked as a team, helping each other, sharing food and stories and pointing out things that inspired them. The European Wilderness Society team shared our knowledge of Wilderness, and the artists shared their perspectives, knowledge and experiences of art and nature. Through WILDArt Plein Art event in Synevyr, I’ve discovered a new wilderness area in which I had the joy to meet amazing companions. In just one week, I’ve learned a lot of new things about nature and also how to connect with people, even though it was a short time. I believe that we made some bonds and in the near future, we will meet again to do some wonderful work. About the park area, in there I’ve found a raw nature, in which the elements of the environment are in a deep connection. That area needs to be discovered for its beautiful places, animals, and plant. Through nature, I believe that we can become better individuals, we will leave the hate behind and we will care about the everything around us. The final day of WILDArts, and we had invited the lead project partners Machaon International, Synevyr Park Management, children from the local village, their parents, local musicians and Yuriy Horvat the head of the Synevyrska Polyana village council to the WILDArt camp for a vernissage and we hosted workshops, exhibitions and a celebration of Wilderness. I did not have an experience like this before. I really liked the team, and the people who came with us. I really had a great time and I really enjoyed it. I would definitely do it again. We had craft stations, where locals could work together with the artists; Liset van Dommelen did printing, Svitlana Kyrlyk and Ruslan Gleb painting stones and bags, Miriam Hartmann and Janin Salzger gymnastics, dance and acro-yoga, and our team did crafts – drawing bears and making wolf masks – and cooking hotdogs on the campfire. Additionally, we had a Wilderness photography and “Human-nature coexistence” exhibitions. For a taste of the event, it was covered in the local news here. Plein Air was nice: place, surrounding, nature, culture, but not enough time to explore it. I wish European Wilderness Society and National Nature Park “Synevyr” a success and believe in future cooperation. Next time would be good to invite more locals to the project. Step by step we will enjoy the wilderness even more, day by day. And I love this kind of teaching or learning for yourself, on how important nature is and to improve it and save it. The week was a success, with opportunities for artists, local communities, Wilderness and learning. We will publish a video of the WILDArt week in a few weeks, and we will promote some of the pieces of Art inspired by the first WILDArt week. We will also soon begin to organise for next year’s WILDArt, with the location potentially Majella Wilderness, Italy. If this wild week sounds like something you may be interested in, please sign up for our newsletter to be the first to hear about any updates! I had a great time in Synevyr during the Wild Art Plein Air. The encounter with so much nature was good and inspired me to do even more with my photography. Meeting the other artists and talking and working together was also inspiring. Right from the first day we were a team. We did a hike to Wild Lake and slept a night in the forest. I woke up before sunrise and tried to find the lake. Within minutes I was lost and after 10 minutes stumbling in the dark I suddenly saw a tent; it turned out to be my own tent. After the breathtaking hike in the Unesco primeval forest I realized that from now on I no longer want to photograph what I see, but will try to express what I feel. I enjoyed being in this first Wild Art Plein Air and I certainly like to do more photo-projects in nature. This is not the first time we are cooperating with our Slovak and Austrian colleagues on the implementation of interesting projects. ”Areas of Inspiration” –this is the next project, which is being implemented in cooperation with “Machaon International” and “European Wilderness Society”. I hope that artists enjoyed the nature of the park and they will come back for new Plein Airs again! Examples of some of the Art already created and with more to follow. Apply now and become our new Erasmus+ volunteer!